In my previous post I discussed how the new KH-11 Keyhole/CRYSTAL USA 245, launched as NROL-65 on August 28, has been inserted into the same orbital plane as USA 186, a KH-11 launched in 2005. I also discussed the current KH-11 Keyhole/Evolved Enhanced CRYSTAL optical reconnaissance satellite constellation in that post. "With the optical component of the FIA program cancelled, I suspect all of the remaining post-1996 Keyholes to remain operational for many years. For USA 129 though, the end should come one of these days, perhaps once USA 245 has been fully checked out and is put on operational status." I have since formulated some more thoughts about the likely timetable and likely sequence of events, which are the topic of the current post. USA 129 (1996-072A) operational, but near operational end? As I wrote before, USA 129 (1996-072A), the oldest KH-11 still on orbit, is now near an incredible 17 years of operational lifetime. With this, it has had by far the longest life-time of any KH-11 so far (see Ted Molczan's KH-11 lifetime data compilation here). A previous satellite in the East plane, USA 116 (1995-066A) was de-orbited in November 2008, some 7 years after USA 161 was added to that orbital plane. This was probably done because it had reached the end of its feasible lifetime (for example, because it was running out of fuel, or because vital components started to deteriorate). It had been operational for 13 years when de-orbited. With the launch of USA 224 on 20 January 2011, slightly over two years later, the East plane was fitted with a second satellite again. This launch probably came so late, because the new FIA Optical program was originally supposed to take over from the CRYSTAL/KH-11 program by 2008. The FIA Optical program was however delayed and then cancelled, and the KH-11/CRYSTAL program reinvigorated. The cancelling of the FIA Optical program, leaving the KH-11/CRYSTAL program without a follow-up, is why I think that the remaining Keyholes will remain in orbit for several more years, except for the exceptionally aged USA 129. The KH-11 Keyhole/CRYSTAL satellites are currently the only high-resolution optical reconnaissance satellites available to the NRO, apart from time hired on commercial imaging satellites (DigitalGlobe). If the lifetime of USA 129 is a guide, the remaining operational KH-11 lifetimes will perhaps be up to five more years for USA 161, perhaps up to ten for USA 186, and perhaps up to 15 years or even more for USA 224 and USA 245. The history of the previous addition to the KH-11 constellation in 2011 might constitute a blueprint of what will happen the coming months, now USA 245 has been added to the constellation. In 2011, USA 224 was initially launched into the same orbital plane as USA 161, similar to how USA 245 has now been launched into the same orbital plane as USA 186. A few months after the USA 224 launch the older East plane satellite (USA 161) manoeuvered to a lower orbit (or more accurately: a more circular orbit with lower apogee), on 24 August 2011. This was preceded by a number of smaller preparatory manoeuvres in the previous two months according to Ted Molczan (priv. com.). This could indicate that USA 224 became fully operational about 5 to 7 months after launch. At that moment it became the primary satellite in the East plane, with USA 161 next taking on a new secondary role in an extended mission, as indicated by its manoeuvre into a different orbit. Subsequently, the orbital plane of USA 161 was allowed to drift slightly eastward. As a result, the orbital plane of the older USA 161 in the East plane is currently located 20 degrees east of that of the newer USA 224, in a similar vein as the orbital plane of the older USA 129 in the West plane is located somewhat westward of that of the newer USA 186. (note: the saga of the significant August 2011 manoeuvre of USA 161 and its eventual recovery by observers including me, has been covered on this blog here, here and here). The orbital planes of the current main West plane satellite, USA 186, and the main East plane satellite, USA 224, are some 48 degrees apart. Likewise, before USA 224 took over from USA 161 mid-2011, the orbital planes of the then main West and East plane satellites USA 161 and USA 186 were 49 degrees apart. Mid 2007, the then main East and West plain satellites USA 161 and USA 186 were 50 degrees apart. This is all very similar, differing by only 1-2 degrees. 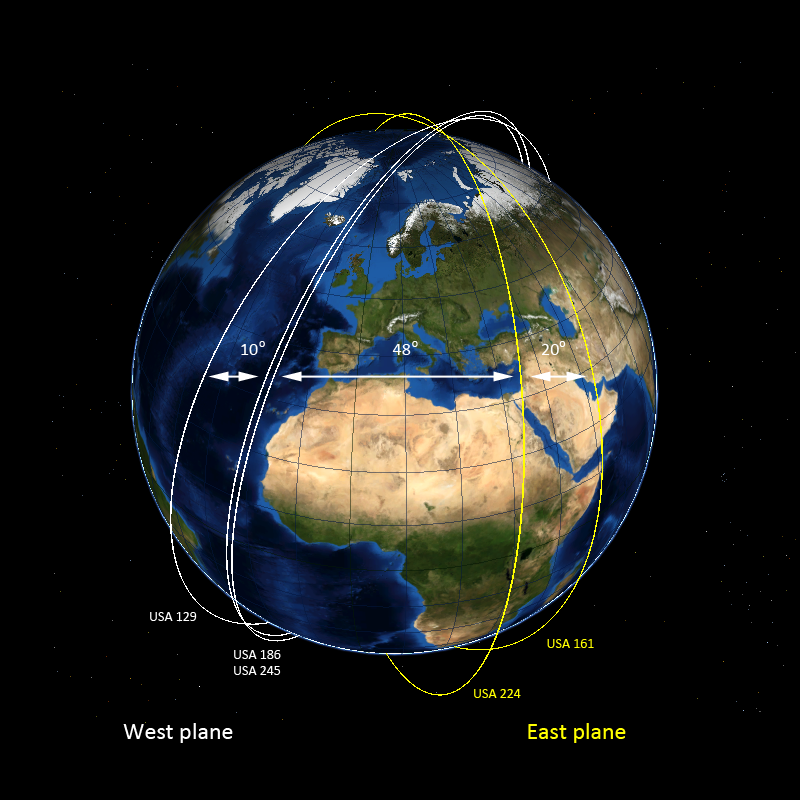 The orbital plane of the secondary West plane satellite, USA 129, is currently located 10 degrees west of the plane of the primary West plane satellite USA 186. The orbital plane of USA 161, the secondary satellite in the East plane, is located 20 degrees east of the orbital plane of the primary East plane satellite USA 224. Mid 2011 this was 2 resp. 12 degrees, and mid 2007 it was 5 resp. 26 degrees. (In this table, RAAN stands for Right Ascension of the Ascending Node. This value determines the position of the orbital plane in earth-centered space with reference to the vernal equinox point at the epoch in question. PER and APO refer to the altitude of Perigeum and Apogeum, and incl is the orbital inclination. See also here. All data are based on orbital elements calculated by Mike McCants from amateur observations, including mine). I do not know what the reason is for the asymmetry between the secondary East and West planes with relation to their primary planes (10 resp. 20 degrees currently), although I suspect it has to do with solar angles at the imaged target locations (the West plane satellites pass in the morning, the East plane satellites somewhat after noon). If the pattern after the addition of USA 224 in 2011 repeats in the West plane with USA 186 and the newly added USA 245, I expect USA 245 to become fully operational around February 2014. Around that time it will become the primary satellite in the West plane. Between now and then, it will probably make more manoeuvers to finalize its intended orbit. We can then next also expect USA 186 to attain a new secondary role and go into a new extended mission, by manoeuvering into a more circular orbit with lower perigee apogee somewhere in February or March 2014. Next, the orbital plane of USA 186 will probably be allowed to drift somewhat westward, as a result of which USA 186 will take up an orbital plane slightly west of that of USA 245. Near that same time, and possibly somewhat earlier if time is really running out on it, we might see the de-orbit of USA 129. After these orbital re-arrangements, USA 224 and USA 245 will be the primary satellites in the East resp. West plane. If history is to go by, their orbital planes will likely be separated by about 48 to 50 degrees. The orbital plane of the secondary East plane satellite, USA 161, will probably be 15 to 25 degrees east from that of USA 224. The orbital plane of USA 186, now the secondary satellite in the West plane, will most likely eventually be located 5 to 15 degrees west from that of USA 245. The orbital planes of the outer (secondary) East plane and outer (secondary) West plane satellites, USA 161 and USA 186, will probably be separated by about 80 degrees. Of course, these are all just no more than educated guesses, based on past configurations and re-arrangements of the Keyhole/CRYSTAL constellation. Time will tell us whether this scenario will indeed play out as I outlined above. It is always possible that we will eventually see something completely different! KH-11 Keyhole/CRYSTAL satellites move in sun-synchronous orbits that have their ground tracks more or less repeat after an integer number of days (1, 2, 4 or more days). The goal is to obtain comparative images of the same location taken a few days apart, taken with similar illumination by the sun (i.e., similar shadows). This aids the analysis of the images for the detection of any changes on sites of interest. As I wrote in my previous post, the West plane Keyhole/CRYSTAL satellites make evening and morning passes. 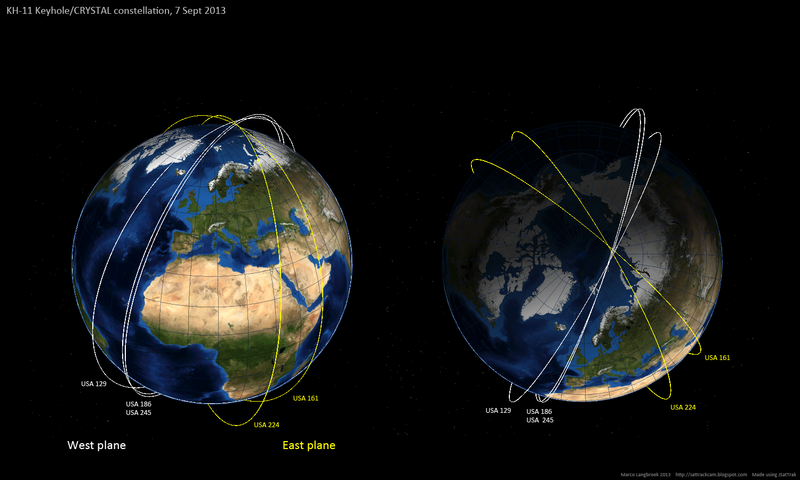 The East plane Keyhole/CRYSTAL satellites make passes 1-2 hours after local noon and midnight. USA 186 and USA 224, the current primary satellites in the West resp. East plane, repeat their ground tracks after 4 days (the 4:59 resonance). USA 129 and USA 161, the secondary satellites in the respective planes, repeat ground tracks after 12 resp. 7 days. When USA 245 has taken over from USA 186 in the West plane by February-March 2014, we can expect it to have a 4-day ground track repeat interval. It will be interesting to see whether USA 186 will attain a 7-day ground track repeat interval similar to the current repeat interval of USA 161. (Update added 15 september 2013: A further and well-illustrated update, documenting and constraining the constellation of orbital planes in past and present even further, can be read here).